This monthly update from the HRH Global Resource Center provides information on the latest resources, improvements, and news from this digital library devoted to human resources for health (HRH). Education and training institutions around the globe are struggling to meet the increasing demand for more health workers who are capable of providing high-quality family planning, HIV/AIDS, and maternal and child health services to expanding populations. A more business-like approach to operating and managing these institutions would allow schools to produce greater numbers of competent and qualified graduates within current, marginally expanding, or even decreasing budgets. However, senior school leaders frequently rise to their positions through academic and clinical promotions, acquiring little formal management, administrative, or business training along the way. 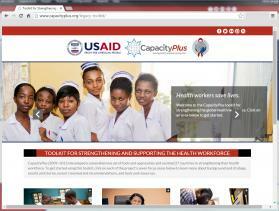 The CapacityPlus final report details the project’s achievements in supporting country-led progress in health professional education, human resources management and leadership, use of health workforce data for decision-making, health workforce retention and productivity, professionalizing under-recognized cadres of health workers, monitoring and evaluation, and addressing gender equality in health systems. Chapters of the report are also available in the project’s legacy series of technical briefs. CapacityPlus held its end-of-project event at the Hilton Hotel/Crystal City in Arlington, Virginia, on September 17, 2015. The agenda featured opening and closing panels on human resources for health (HRH) investments and future priorities; a project overview from CapacityPlus project director, Kate Tulenko; a video showing comprehensive HRH strengthening in Uganda; a storytelling session placing the project’s work in the context of the challenges faced by an individual health worker; a marketplace with demos of project tools and approaches; and two rounds of interactive breakout sessions in which participants learned more in-depth about CapacityPlus’s country-level results and lessons learned.